Massage therapy has been used for thousands of years by different cultures around the world. It is a practice that has become more and more popular over the years. The field of massage therapy continues to grow, and is expected to have continued growth into the future. It is estimated that there are 280,000 to 320,000 massage therapists and massage school students in the U.S. It is predicted that the field will continue to grow by 20% over the next decade. One reason for the continued growth in the field is that medical professionals are now seeing results from clinical studies that indicate that using massage therapy is good for your health. It is no longer seen as just a luxury. Massage is now being used in a number of clinical areas for treatment of medical problems such as asthma, anxiety, bronchitis, headaches, allergies, sports injuries, and in patients with joint and muscle diseases like arthritis and fibromyalgia. It is also used in cancer treatment centers as well postoperatively, to ease withdrawal symptoms from alcohol, and to reduce heart rate and blood pressure. There are many more positive health benefits of massage. In society today, people are becoming more aware of the importance of taking care of themselves and their health. They are more apt to seek massage therapy for managing pain, increasing energy, lowering stress levels, and managing other symptoms created by various physical and emotional disorders. Massage therapists help people feel better and they have many different ways to deliver the relief. Currently, there are over 200 types of massage methods, each using various techniques. A few of the most popular types of massage are Swedish, deep tissue, and sports massage. Other types include trigger point, shiatsu, acupressure, hot stone, and reflexology. Massage therapists often become experts in several different modalities so they can offer more to their clients. There are newer forms of massage that are growing in popularity, too, such as “Watsu” or water shiatsu. This type of massage occurs in water. Massage therapists typically confer with their clients before treatment to determine what type of massage is best for each individual client, as different massages are used depending on the client’s condition and desires. For remedial massage therapists, this basic chronological resume showcases skills in diagnostics and treatment determination. The focus is on describing the techniques you have applied in real-world situations and the progress for clients suffering from various ailments. Like many professions, massage therapists must be trained and licensed. Requirements vary greatly by state. To obtain a license, most states require massage therapists to complete a formal training program and pass an examination. College and university programs typically require a minimum of 500 hours of training. Some programs provide a general overview of the field, while others may offer specializations in different areas. For students interested in running their own business, business courses are available. Massage therapists are employed in various types of environments. Some work in private physician’s offices, nursing homes, or hospitals. Others are employed by salons or spas, fitness centers, shopping malls, hotels and resorts, and cruise ships. Some offer the flexibility of traveling to clients’ homes or offices to provide massages, others have private offices and have the convenience of working out of their homes. Massage therapists can work full-time or part-time. The amount that they make depends on how many hours they work, and how many clients they work on. Due to the physical demands of massage, full-time is defined as 17 or more hours of actual massage a week. Additional time is usually spent on things like billing, scheduling, housekeeping, and marketing, to name a few. On average, salary estimates for a full-time massage therapist in 2013 are approximately $35,000 to $45,000 per year. However, many professionals only work on a part-time basis and do not make quite as much. Massage therapy is a customer service-oriented field. Massage specialists work directly with all sorts of clients, and many people are initially a bit hesitant and uncomfortable with the process of massage therapy. To be a successful massage therapist, it is important to have compassion, as well as good listening and communication skills. Providing a calming and relaxing environment is essential. Clients expect to feel relaxed and at ease when receiving a massage. As noted earlier, physical stamina is also important. Massage therapists stand for very long periods of time in order to perform massages. They also need to be able to lift approximately 50 pounds as they are constantly moving and lifting different parts of the body while performing massages. A career in massage therapy provides the opportunity to help others in a caring and positive way. With it also comes flexibility and stability. With increasing demands for more massage therapists in the near future, it is a perfect choice for someone who is looking for a career where the rewards are both personal and professional. This hybrid resume is for a massage therapist with a decade of experience in the industry, a broad range of knowledge, and professional qualities. It emphasizes both the therapist's list of acquired skills—including ancillary skills related to operating a massage business—as well as a long and steady work history. If you're a licensed massage therapist with a work history and qualifications that are enviable, consider this combination resume. That skills and qualifications are listed first and show the applicant's proficiency in a various massage therapy techniques as well as concern for patients' well being. Also featured is the list of professional experiences, which highlight the therapist's extensive therapeutic expertise. 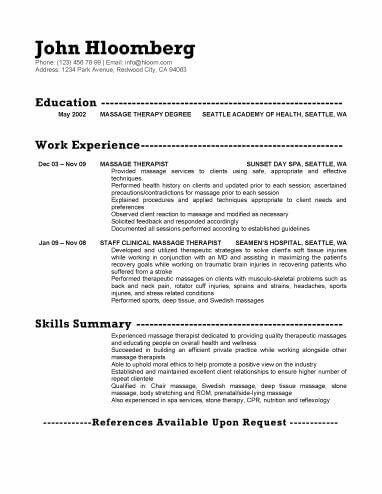 This progressive resume expresses the therapist's ability with both different massage techniques and operational skills. The latter includes not only building and keeping clientele, but also preparing reports, keeping confidential files, and cleaning and sterilization of massage rooms. This resume projects a strong image of the candidate's work ethic and advancement potential. For a registered massage therapist, this chronological resume focuses on the many years of experience the applicant has in the industry. It lists the techniques used in previous positions, and includes an interest in the alternative medicine of psychodynamic psychotherapy. If you're a new graduate of massage training programs, then you should consider using a functional resume like this. The emphasis is on the techniques learned in school and the candidate's preparedness for professional life. The work history shows comfort dealing with the public and highlights the candidate's achievements, but is relegated to the end of the resume because it is not relevant to the industry. This professional, functional resume is for a massage therapist with limited or inconsistent work history, but with an extensive knowledge of the field and an impressive list of qualifications. The focus is on skills, expertise, and bedside manner. Employment history isn't included. If you want your resume to emphasize your bedside manner, then this style is for you! The emphasis in this chronological resume is on the patients' needs. Unlike other resumes, the different techniques used by the therapist are not gone into in depth, but instead the resume states the kinds of clients helped. The implication in this kind of delivery is of a capable therapist who puts the needs of her clients first. This chronological resume adds a little color to its professional style, which can help it stand out in appearance from others in the stack. It was created for a recent graduate of massage therapy whose only previous experience was in a work-study program. The emphasis is degrees and certifications earned, and GPA. If part of your expertise is in the operations of a massage therapy clinic, then you should check out this functional resume. Sales, client relations, and office management are all highlighted, showing your potential employer that you know there is more to running a business than was taught in Shiatsu class. While employment history is left out, daily responsibilities pertaining to client and prospective client contacts are detailed. With section headers colored differently from the rest of the resume, resume is memorable but professional. Educational institutions attended, certificates earned, and honors received for high performance are emphasized, as are skills developed in training. Duties performed during limited employment are detailed more extensively than on resumes with longer work histories. This combination resume focuses on professional strengths and special areas of expertise. Work history is included but listed second. Specialty skills in business development are featured, making this a strong resume option for candidates aspiring to junior management and sales or sales management roles. Applicants who've owned and operated their own massage clinic, but who find themselves applying to other businesses, should consider this resume template. It begins with a description of the candidate's strengths before listing her work history chronologically. This technique allows the candidate to show her own selectivity in choosing a new work environment, as well as her history as an owner and operator of a massage clinic. The resume features the applicant's interest in performing high value-added tasks, and goals reflecting commitment to exemplary accomplishments in client retention. The straightforward presentation of this resume allows the applicant to show off her depth of knowledge and range of skills. By providing a summary of qualifications, listing the applicant's skills, and finally showing a steady work history, this hybrid resume packs a depth of experience onto a single page. Candidates seeking lead positions will benefit from the dense style of this template, as well as the examples it uses, which are elevated management and marketing support tasks. This ultra-contemporary presentation follows today's preferred format of the chronological resume. Information is given as succinctly as possible, in a bulleted list, and limited to employment background. Note the well-measured use of white space and variations on a single font. This resume style is best for applicants with strong work history. By cleverly listing qualifications, this resume presents the newcomer to the field as an efficient candidate who will bring fresh perspectives to the therapeutic massage industry. The bold approach of this all-centered, streamlined resume makes an impression for the candidate that her scant work experience cannot. Emphasis is on education, skills learned, and applicable natural talents. This polished resume stands out with space for a customizable image. Emphasis is on communication, skills required to guide clients through rehabilitative programs, and analysis of clients' therapeutic needs. Maintenance of organizational systems and proficiencies in therapeutic treatments are also emphasized. Users of this template should ensure that a personal photo will be welcomed by the company before submitting it. 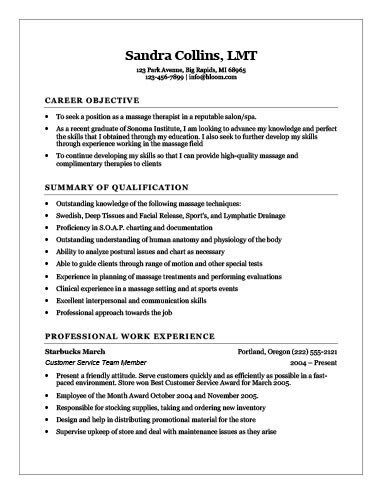 In this hybrid resume template, the applicant shows his massage therapy degree, lists his employment history in the industry, and provides a summary of relevant skills. With his employment dates prominently justified to the left and work experiences with hanging indents, this style of resume would be best for people who have worked for leaders in their industry and who have steady work histories.